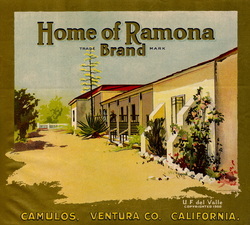 The Land of Sunshine takes place in and around Rancho Camulos, in Ventura County, shown here in a modern photograph, on the right, and an original fruit crate label from the era in which the novel takes place: 1906-1920. Two young people from a small Ventura County town dream of going to Los Angeles, one to act in the new “moving pictures,” the other to be a newspaperman. Phillip Dudley falls in love with Josephine Reyes, who falls prey to a disreputable movie producer, then winds up in a bad marriage to save her family. Phillip succeeds at the Times, but in the end cannot save his friend from her self-destructive behavior. The book focuses on the Los Angeles of the period (1906-1920), and pays close attention to characterization and plot. The story moves across the landscape of early California, centering around real-life Rancho Camulos, the setting of Helen Hunt Jackson’s 1884 novel Ramona. We witness the growth of the motion picture industry, as well as the profound impact of water, oil and citrus on the development of Southern California. The plot includes such notables as D.W. Griffith and Mary Pickford. The notorious writer and raconteur Charles Lummis is prominent throughout. I wrote The Land of Sunshine after learning about Josephine from a tape recording left behind by my grandfather, in which he describe her death when a mob attacked her home. She seemed to me to be such a beautiful, bright, energetic young woman whose life story deserved to be told. So I invented a life for her.